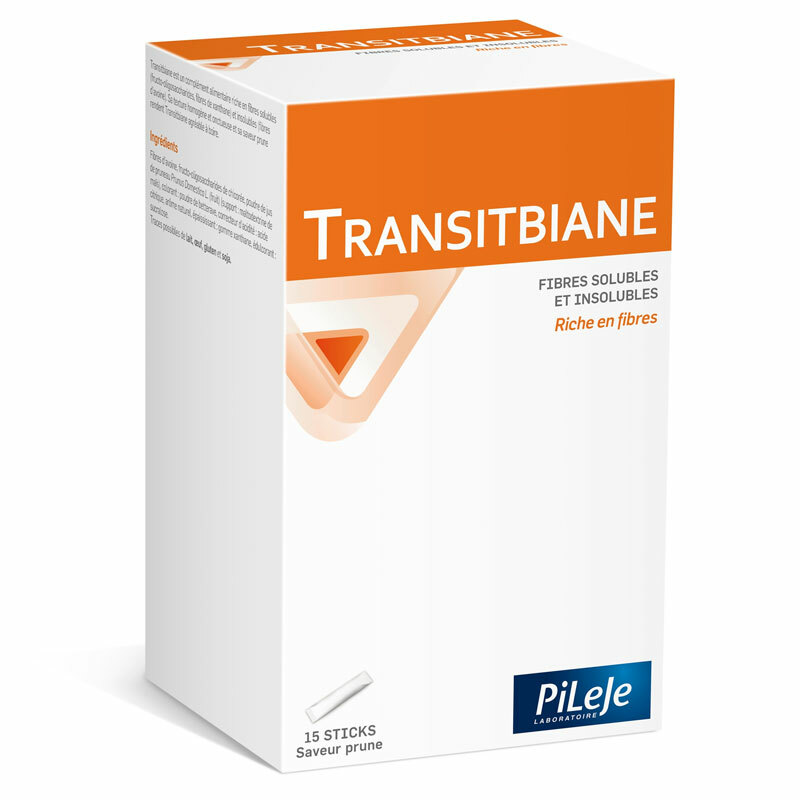 Transitbiane Pileje is recommended in cases of intestinal transit slowed. TRANSITBIANE is formulated to promote healthy intestinal function. The average French consumer fiber is 17g per day as our daily needs are 30g. The beneficial properties of the fibers are well known. Are not or poorly digested, they will constitute the main content of the colon. With 5.7 g of fiber per bag, Transitbiane Pileje helps you maintain digestive comfort. 1-2 sticks per day transitbiane swallowing diluted in a glass of water. To be taken preferably before meals or at night before bedtime. A box 15 of sticks allows use of 7 to 15 days. Like all rich in dietary fiber products, Transitbiane should not be given to children under 8 years old without medical advice. Soy fiber (50%), fructo-oligosaccharides from chicory powder, prune (emulsifier: soy lecithin), prune flavor, acidifier: citric acid, stabilizer: guar gum, anti-caking agent: silicon dioxide, color: plain caramel , sweetener: acesulfame potassium. With sweetener. The term "soy" includes seed which is one of the most nutritionally rich natural foods. It contains 33% protein, 18% fat and more than 20% dietary fiber (complex carbohydrate). The soybean fibers are obtained from the cell material of soybean and consists of a combination of soluble and insoluble fiber. This ingredient is IP (Identity Preserved) guaranteed.